Life is too complex for anyone to expect to exist in a perennial state of harmony and bliss. The reality is that in the daily push and pull of our lives, there are many sources of conflict and anger. Despite the negative image, however, conflict and anger need not erupt in disaster. They can often be opportunities for developing new skills, furthering personal improvement, and growing toward full potential. But you must take advantage of them. Life is too complex for anyone to expect to exist in a perennial state of harmony and bliss. The reality is that in the daily push and pull of our lives there are many sources of conflict and anger. Despite the negative image, however, conflict and anger need not erupt in disaster. They can often be opportunities for developing new skills, furthering personal improvement and growing toward full potential. But you must take advantage of them. Because of lifelong beliefs that conflict and anger are “bad” reactions to be avoided or merely survived, few of us have learned to handle either of them productively or to make the most of the opportunities they provide. 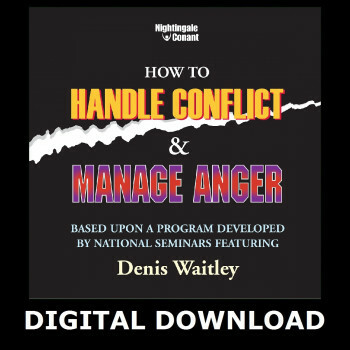 How to Handle Conflict and Manage Anger is based on one of the best-selling seminars developed by the National Seminars Group. In it, Denis Waitley discusses the proposition that it’s not so much what happens in our daily lives that matters, but how we perceive and respond to those events that determines our success or failure. He examines the effects of continual change in our personal and professional lives. He counsels that anger is a choice we make, not an event that simply happens. And he confronts what he considers the two most important issues in human relations: understanding each other and dealing effectively with our disagreements. 5 myths about anger and conflict – and what the truth really is. 4 steps that will keep you cool, calm and in control most of the time. 5 conflict-escalating words that should be avoided at all costs. 5 styles of conflict management: dominator, compromiser, withdrawer, and collaborator. 10 conflict-resolution skills everyone must know. 6 tips on handling harassment and hardball tactics. In a powerful, practical fashion, and employing numerous examples and real-life stories, Denis Waitley explodes the misconceptions and establishes the facts about two of the most misunderstand – and ultimately useful – constants we must face in our lives. How to Handle Conflict and Manage Anger serves anyone seeking personal and professional growth, revealing the skills essential to taking what life has to offer and incorporating them in the drive to success.